Just looking at this picture, I get goosebumps, and not in a good way. Like so many people out there, I am terrified of spiders, I can't even go to sleep in a room if I know, or sometimes even just think, there's one hiding somewhere. I'm also scared of most reptiles, especially lizards and snakes. It's not that I'm scared of what they will do to me, but I'm horrified by the thought of what I will feel if they were to come in contact with my skin. Aaaah! My mother is the only person I know that is not afraid of these things. She's the one that catches the spiders and other creepy crawlies, while the rest of us are standing on chairs or running in the opposite direction. She loves the frogs and lizards in her garden for crying out loud! I judge her. Okay, so I know the fears that I have are common fears, and also mostly rational. But there are people out there with some very irrational fears. 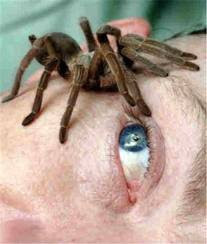 Did you know there is a phobia called Arachibutyrophobia? It is the fear of having peanut butter sticking to the roof of your mouth. Huh?! Say what? Why would someone be scared of that? I guess that's why a phobia is described as an irrational fear, because that doesn't sound scary to me, in fact, it sounds freakin' delicious. Also, I learned about a phobia called Consecotaleophobia. Can you guess what that is? It is in fact the fear of chopsticks. Yes, you heard me. Chopsticks! Now, when I think about it, I might of had a slight case of Consecotaleophobia when I first came to Taiwan, because I had no clue how to use it. But really, the only thing that would scare me about chopsticks now is if there was a spider sitting on it, and I was very hungry.